Format: A DVD-R disc in DVD sized case, with full colour cover, released on the Depressive Illusions label (Ukraine) in 2013, cat ref cut 1207. Uruk Hai contribute two songs to this compilation. You know you've let yourself in for one hell of a task reviewing an album when it isn't until the 53rd song until the band you're waiting to hear shows up! There are only two possible courses of action with such an monstrous proposition as this Depressive Illusions tribute compilation: take a high level overview of the thing, or dive into the murky depths and risk all of your SAN points in a Call Of Cthulhu-esque insanity raid. 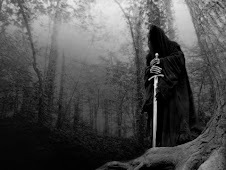 Nazgul is no fool - he is adopting the high level approach. But you'd seriously have to wonder at the thinking behind the construction of this release. Firstly, and on a very mundane note, a DVD-r is almost in every way less practical than a CDr as it won't play on standard CD players. Can I listen to this on the way to work in the car - no. Can I give it a spin on the death-deck in the castle library - no again. OK, you get a ton of material on the DVD-r that otherwise would be needing a multi-CD set to accommodate, but even so not the most convenient of releases to get to grips with. Secondly, and most significantly, there's the issue about just how many versions of a particular song you really need to hear on one album! The proven business model for the vast majority of tribute albums is to cherry-pick the best version of a specific song, preferably by a band you've heard and care about, and present as an album of maybe 10-12 different songs. Simple, or so you'd think, a veritable licence to print money. The approach from Depressive Illusions has been radically different, and seems to focus on shoe-horning as many possible versions of a limited range of songs as humanely (or, arguably, as inhumanely) as possible onto one disc. Now, all power to their arm for trying something different, but this level of overkill is quite daunting. Nazgul challenges you with a simple question: just how many versions of 'Dunkelheit' do you seriously need to hear on a Burzum compilation? One, or maybe two at a pinch if it's a double-album? Try 8 on this offering, including 6 consecutive tracks all covering the same song! Honestly, you'll go mad before the end of the fourth version, and just when you think the torture is over after 6 in a row then the damn thing pops again twice more before you're done. Why? Why do I need to hear the same song six times in a row? It's not the most complex of tracks, there's not a lot of nuance or twiddly bits to get my head around, so why in the name of all that's holy do I need this looped around my speakers? It's like having a demon child repeatedly playing the same note over and on a toy piano, a musical version of Chinese water torture if you will. This is repeated across large parts of the disc: the album begins with 5 back-to-back versions of 'Han Som Reiste', by way of another example. And if it was presented like like this in predictable blocks, perhaps you could get a handle on it and work out a coping strategy. But it's not all as consistent as that; other songs periodically appear scattered across the track listing. For instance, there are (mercifully) only 3 versions of 'Hermodr A Helferd', two of which appear as tracks #6 and #7, but the third (the Uruk Hai cover) only pops up at #54. Why this difference in running order and methodology, you ask? No idea. A similar thing happens with 'The Crying Orc' - three successive covers at tracks #27-#29 but then you'll be hanging on until #53 for the Uruk Hai version. Speaking of which, the two Uruk Hai songs on this release are not unique to it, and we've encountered them on our travels before: 'The Crying Orc' appears on the split release "Ancient Remembrances", whilst "Hermodr A Helford' goes back much further, debuting on the split release "-2-" with Vinterriket in 2005. It really is a most perplexing way to compile and album, and it infuriates as much as it entertains. Even the most die-hard Burzum fan would surely baulk at the prospect of listening to multiple covers of the same basic songs over and over again, particularly in cover-version format where it's not even Varg himself tinkling the ivories. For a casual listener it could even turn you off wanting to hear another note of Burzum for the rest of your life. The album is in essence like the world's (current) strongest beer, Snake Venom, at 67.5% ABV. This literally venomous beer may well come in a 275ml bottle (and, at £50 per bottle, will cost you a pretty packet) but the brewers recommend they only intended it to be sipped in servings of 35ml per session. Little and often, you see. Nazgul would strongly recommend that "Tribute To Burzum" be treated with equal caution, and only digested in small quantities of perhaps 7-9 songs at a sitting. And if you want to remain sane, Nazgul would further recommend pre-selecting the play list to specify individual different songs, perhaps grouped by artist, otherwise you might find yourself listening to the same thing over and over in some form of hateful deja-vu inspired nightmare. Or maybe that's the effect Depressive Illusions were aiming for - Nazgul wouldn't put it past them! In fairness, and without being overly negative about this release, there are positives to celebrate too. Clearly a lot of work has been put into it, from the design of the cover artwork (including all of the myriad band logos illustrated on the inner sleeve) to the effort in tracking down and compiling the multitude of tracks. There's an astonishing global coverage of bands represented here too, aptly demonstrating that the black magic of Burzum has permeated the planet from Costa Rica to Indonesia, from Australia to Argentina, and from Mexico to the Ukraine, via the expected stopping off points in Europe and the US of A. It is truly a global album, and despite the limitations of the original music there's enough on here to find something interesting to listen to. Just not all in one go.